Democrat Barack Obama won an extraordinary two-year struggle for the White House, beating Republican John McCain to become the first black president in US history. 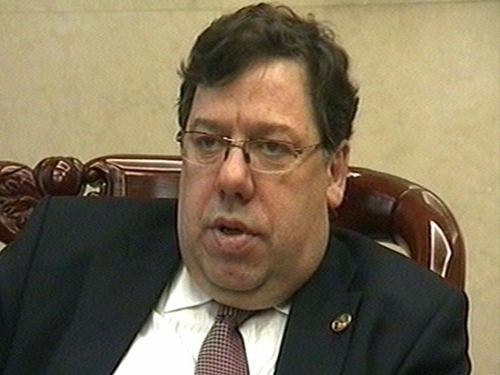 Taoiseach Brian Cowen has sent a message of congratulations to Barack Obama on his election as the 44th President of the United States. The Taoiseach also formally invited President-elect Obama to visit Ireland and his ancestral home in Co Offaly. President McAleese has this morning warmly congratulated Barack Obama following his historic election victory. She said that she wishes Senator Obama every good fortune in the most demanding role of President of the United States of America. Former South African President Nelson Mandela has praised Barack Obama's victory in the US presidential election and urged him to fight poverty and disease throughout the world. 'Your victory has demonstrated that no person anywhere in the world should not dare to dream of wanting to change the world for a better place,' the anti-apartheid icon wrote to Obama in a letter released by the Nelson Mandela Foundation. 'With the world in turmoil and doubt, the American people, faithful to the values that have always defined America's identity, have expressed with force their faith in progress and the future. Barack Obama's US presidential victory is 'a historic day' for the Middle East and nations in the region hope he will prove to be an 'honest broker', Arab League chief Amr Mussa said. 'We should seize the opportunity to express congratulations and in stressing the importance of this day,' said Mussa in an address to the European Parliament's foreign affairs committee. 'I also stress the importance of the message that Mr Obama has never ceased to send, which is we all need change and that is what we do expect from the new leader of the United States,' he added. 'I look forward to meeting with the President-elect so that we can continue to strengthen the special bond that exists between Canada and the United States. 'Africa, which today stands proud of your achievements, can only but look forward to a fruitful working relationship with you both at a bilateral and multilateral levels in our endeavour to create a better world for all who live in it.